SOCCER: Gladstone's junior footballers should be forgiven if they forget their pen, paper or calculator at school today as they're likely to have their minds on junior soccer grand finals. Players will look to take home glory, not homework, as five months of hard work comes to fruition tonight at Sun Valley Oval and tomorrow afternoon at Clinton Oval. Three games - under-14, under-15 girls and under-16 boys - will take place at Sun Valley, while the under-12 decider will be played tomorrow at 3pm. 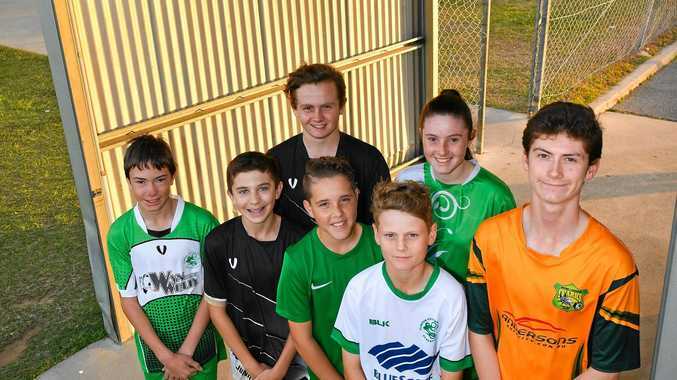 One of those teams is the under-14 Central Pumas, who are heading into this evening's grand final against the high-flying Clinton Jets in a rich vein of form. The Pumas finished the regular season in third place with eight wins, one draw and three losses, but will head into the decider with confidence after defeating second-placed BITS Bloodhounds 2-1 in last week's preliminary final. While the side is predominately male, it has two key female players in striker Keely Hooper (16 goals from 13 games) and defensive midfielder Jordan Porter (five goals in 14 games). But coach Julie Porter said it was a collective team effort that had the Pumas ready to pounce on the Jets from 5.30pm. "The Jets are a well-drilled and well-trained team and they've got a lot of attacking power," she said. "However we believe in grand finals anything can happen and we think we've got the talent to do them. "We hadn't beaten (BITS Bloodhounds) all season... but everybody gelled on the night and Rhys Cogill put his hand up to be goalkeeper and did a fantastic job. "Our kids are trusting each other more and believing in themselves and we've got a strong defensive line which has helped us tremendously. "With kids this age it's still difficult to get them to want to play in defence but those boys are happy to stay there so that makes my job a lot easier." Meanwhile, the under-12 Clinton Cyborgs will be hoping for no crossed wires as they look to complete a perfect season against Clinton Cannons.